Paul Simon sang, "I get all the news I need from the weather report," which this newshound can't honestly say of himself. Still, at the risk of complaining about some of the easiest weather, generally speaking, in the continental United States: it's been a perfectly incontinent(al) March here on the Left Coast. After a weirdly dry winter, it was lashing rain on Tuesday of this week, as it was much of the week before. I know, I know, break out the violins. The skies were clear and the sidewalks were dry by yesterday (Wednesday) afternoon, but I'm just sayin'. Have you been watching Chicago's record heat this month? Eight, count 'em, eight days this month during which the thermometer hit 80 degrees or higher. This. Does. Not. Happen. In. March. In. Chicago. At this time of year, 'normal' in The Windy City hovers in the 30s and 40s. Boyle's novel was published in September 2000, so we're sitting right now about halfway between its publication date and the novel's present-time. The other day I was leaving Moe's Books in Berkeley with a fresh-bought copy of Ann Patchett's State of Wonder in my bag when a newspaper on the free-newspapers rack by the door caught my eye. It was this week's edition of the Bay Area Reporter, and the headline article is what grabbed my attention: 25 years later, activists recall ACT UP's legacy, by longtime B.A.R. journalist Liz Highleyman. There were a few things about this article that made me take another look, then pick up a copy of the paper and read. First, I was involved in the early days of AIDS activism, though I worked more closely with a group called Stop AIDS Now or Else than with ACT UP per se. SANOE started as a sort of underground spinoff of ACT UP, a group that formed to plan a disruptive political action that would have been thwarted if it were planned publicly. Surprise was our friend. We surfaced for the first time to blockade the Golden Gate Bridge in 1989, and continued to work in a similar vein over the course of several years. I went to a few ACT UP meetings in San Francisco and found the scene too sprawling to feel I had a place there. Anyway, second: it was sobering to see a political movement of which I was a part being remembered as quarter-century old history. Third, the front page photo, snapped by photographer Rick Gerharter (who I remember as a camera-wielding fixture at demonstrations in the 1980s) included two people I recognized immediately. One was an old friend, comrade, and fellow student of Tai Chi whom I haven't seen in quite a few years. The other was a former lover, who lost his war with HIV not many years after our brief relationship. The article is a well-drawn encapsulation of a political movement that substantially changed how people relate to doctors and the health-care industry in the U.S. Before ACT UP, people by-and-large trusted their doctors to know best. Doctors and scientists were the ones with the training, the degree, the authority. Since ACT UP, and especially now with the help of the intertubes, patients advocate for themselves individually and in organized groups. ACT UP was a game changer in the history of U.S. health care, and, as Highleyman's article points out, a deep and lasting influence in late-twentieth and this century's U.S.-based social justice movements. But the photo also served to remind me that an inescapable legacy of that era is the loss of friends, lovers, and comrades who didn't survive the ravages of AIDS. Everybody of a certain age, in pretty much any of my circles -- professional, political, artistic, local -- can reel off a long, sad list of friends and lovers who died way too young. These many years later the wounds are old scars, the sort one has learned to live with. David S-- was in his early thirties when we were an item, and he gave me a hard time when he imagined that I imagined him perhaps a smidgen too old for me. I was six or seven years younger. Not long afterward David was gone. Nowadays, "early thirties" strikes me as wet behind the ears more often than not. David had an empowering time at the October 1988 ACT UP demonstration at the offices of the FDA in Rockville, Maryland, which is where the image accompanying this week's B.A.R. article (and this post) was photographed. As a souvenir he brought back one of my all-time favorite Demonstration Chants In History. When police readied themselves to haul away protestors blockading the FDA building they donned rubber surgical gloves, to protect against the imaginary danger of becoming infected by touching someone infected with HIV. In response, demonstrators scolded them for their distressing fashion faux pas: "Your gloves don't match your shoes! Your gloves don't match your shoes!" Nothing like a little farce to lighten up a demonstration about life-and-death access to health care. It turns out you can glimpse David S-- speaking to a camera through the narrow window of a police bus after his arrest outside the FDA headquarters in How to Survive a Plague, a film directed by David France that chronicles AIDS activism in the U.S. The film showed at Sundance earlier this year, and this weekend in Manhattan (it'll also be shown at MOMA in New York tonight at 6pm Eastern). The film will soon be broadly released. Amy Goodman interviewed the director and founding ACT UP member Peter Staley this past Friday on Democracy Now! David S--'s few seconds in How to Survive a Plague is excerpted at ~37:30 of the DN! video, embedded in the linked article. Says Peter Staley toward the end of the interview with Amy Goodman: "Anybody who wants to change the world should run to see this film." David S--, Stephen, Jason, Jay, Bob, Roger, Colin, David E--, Paul, Tom ... and so many more. Gone, but not forgotten. Thanks to friend, fellow-writer, and longtime comrade in the AIDS movement and beyond, Kate Raphael -- quoted in this week's B.A.R. article -- for calling my attention to Amy Goodman's interview on Democracy Now! A friend sent me a copy of Sergei Dovlatov's 1981 novel The Compromise, translated from the Russian by Anne Frydman in 1983. The full context in which my friend recommended Dovlatov will remain unblogged for now, but it was hard not to read into the book, however anachronistically, a hyperbolic spoof on Journalism In America Today. Dovlatov's brief (148 page) novel is a smackdown of journalism (and public honesty, generally speaking) in the Soviet Union. 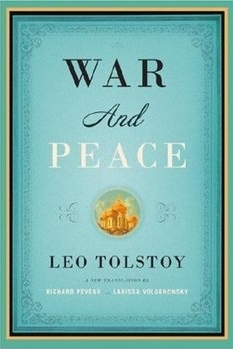 Dovlatov the author worked as a journalist before he emigrated to the U.S. in 1979. Dovlatov the thinly-fictionalized journalist begins each of his eleven tales with a brief article written to meet government requirements as conveyed by bureaucratic and indifferent editors; and continues with a sad (and utterly compromised) story behind the story. Vodka is always involved. And life is never as it's reported. The tenth compromise, for example, is a manufactured correspondence between an Estonian dairymaid called Linda Peips and Leonid Brezhnev, the (actual) General Secretary of the Central Committee of the Communist Party of the Soviet Union from 1964-1982. The story behind the story is a pathetic, drunken, girls-in-wet-bathing-suits junket by Dovlatov-the-journalist and a photographer colleague. In the five hungover minutes before leaving to catch the train home, Dovlatov dashes off his assignment: a ghost-written letter to the General Secretary, describing, in her own falsified voice, Peips' "unprecedented" achievements. And what are these? Why, obtaining a record-breaking quantity of milk from a single cow; and, even better, being invited by her farm-comrades to become a member of the Communist Party. Hosanna! "Translate this," I said, cutting him off. "How did Linda manage such high results?" Bella translated. The dairymaid fearfully whispered something back. "Write this down," Bella said. "The Communist Party and its Lenin Central Committee --"
I found myself laughing out loud at the author's dour absurdities, from the one just quoted to an editor's refusal to let Dovlatov-the-journalist choose, for the subject of a series titled "A Meeting with an Interesting Person," a gentleman who studied carcinogens. Why? Because "cancer is too sad a subject. It engenders negative emotions. It calls up associations with a certain notorious banned novel..."
So what does Soviet-era journalism have to do with the state of news media here in the 21st century U.S. of A., as this blog post's lede suggests? Well one of the problems we've had for a number of years with the media, the entire media, especially journalists, is that these charges get put out there, either against the Bush administration or somebody else, and journalists don't really examine the substance of them like they do during a political campaign. At least in the Washington Post, and sometimes on O'Reilly with his reality check on this channel, they look at certain claims or promises to see what the facts are behind them. And the facts are [...] that no president has the power to increase or to lower gas prices, those are market forces. Romney to Obama: Fire 'gas hike trio' (18 Mar 2012): President Obama ought to fire his top energy advisers, Mitt Romney said Sunday dubbing the group the "gas hike trio" for what he says is their desire to see gas prices go up. The Republican primary front-runner said Energy Secretary Steven Chu, Interior Secretary Ken Salazar and Environmental Protection Agency Administrator Lisa Jackson are all responsible for implementing policies that are contributing to rising gas prices. Obama seeks halt to tax subsidies for oil industry (16 Mar 2012): In the weekly Republican address, Rep. Cory Gardner, R-Colo., said his constituents have been hard hit by an increase in gasoline prices and were "fed up with the way the president is handling this issue, and rightfully so. The most forceful thing the president has done about high gas prices is try to explain that he's against them." Would the 'Merican take on corrupt journalism, corresponding to Dovlatov's The Compromise, be Al Franken's book, Lies and the Lying Liars Who Tell Them? Or is there room to take Fox's reporting as something other than highly biased and selected spin, but instead as "just the facts" transcription of the damndest things that politicians say? I suppose the billboard pictured above gives away my answer to those questions. At all times, we report for our readers and listeners, not our sources. So our primary consideration when presenting the news is that we are fair to the truth. 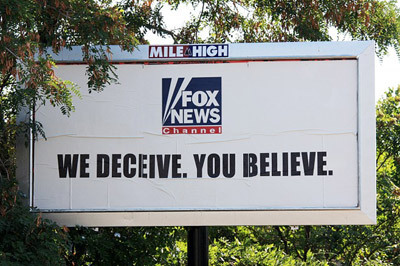 If our sources try to mislead us or put a false spin on the information they give us, we tell our audience. If the balance of evidence in a matter of controversy weighs heavily on one side, we acknowledge it in our reports. "Fair and balanced"? Shabby "he said, she said" spin journalism? If you take Fox News as a reliable source of information your answers will differ from mine. Here's hoping NPR lives up to their handbook for many years to come. But in the broader frame, for all Fox's slick production values and for all Senator Franken's wit, I don't suppose we have anything on the 20th century hypocrisy of the Soviets. 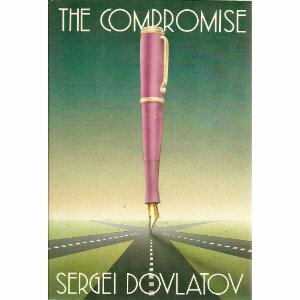 An English translation of The Compromise isn't currently in print, but check your local used bookstores and libraries. It's a perfectly astringent mood-setter for these campaign-saturated months that all but demand the bitterest, darkest irony. Democracy makes your head hurt? What else you got? When my BFF was a student at the San Francisco Art Institute I sometimes crossed the bay (I was a student at UC Berkeley at the time) and hung out in the screen printing studio there, where J-- did most of his work. I never learned enough to orchestrate the process myself, but over the SFAI years and afterward I became a pretty decent silkscreen artist's assistant. Some of J--'s prints still grace the walls of my apartment. There's a lot of down-time in artists' studios, waiting for ink or paint to dry, for a photo emulsion process to work its magic, for the worst of a hangover to pass -- all manner of idle moments. These are often the times when ideas blossom. For J-- and I, they were often when we'd engage in theo-philosophical discussion about How Everything Relates To Everything Else, a discussion that has continued over the course of more than three decades. We haven't arrived at any conclusive answers yet. On the other hand, we haven't tired of the topic! One day in his SFAI studio, in the heat of a passionate theo-philosophical discussion about How Everything Relates To Everything Else, J-- applied his gift for drawing to a sketch of our emerging ideas on a scrap of paper. I have wished again and again since that we'd kept that sketch, though I suppose J-- could reproduce it, conceptually at least, without breaking a sweat. Me, not so much. I tried this weekend, the result was laughable. I'm reduced to describing the concept in words. The answer of that moment -- to the question, How does everything in the world relate to everything else? -- had to do with everything being connected to everything else because everything is a manifestation of the same underlying substance and/or spirit of the world. There may have been some contested details in that "and/or," but I honestly can't remember who took which side of which exact issue. J-- and I have regularly switched apparent-positions over the decades. It's always been about convergence. Anyway, J--'s drawing was of a partial arc of the earth, the surface of which (okay, the circumference, two-dimensionally-speaking) sprouted people, trees, flowers, animals, and all manner of other living beings (and perhaps some inanimate ones as well, or maybe that came into the picture later on) -- each of which was rooted in and (graphically speaking) open to the same underlying, universal mass of everything. As if everything that exists were a thought bubble of the same stuff and/or consciousness. You could call this "same stuff" Wuji (無極), or Puruṣa (पुरुष), or Chaos (χάος), depending on your theological or philosophical frame of the moment. At one time or another, J-- and I probably called it each of these and more. But, you may wonder, why am I moved to take this trip down theo-philosophical memory lane? And suddenly a long-forgotten, meek old teacher, who had taught him geography in Switzerland, emerged in Pierre's mind as if alive. "Wait!" said the old man. And he showed Pierre a globe. This globe was a living, wavering ball of no dimensions. The entire surface of the ball consisted of drops tightly packed together. And these drops all moved and shifted, and now merged from several into one, now divided from one into many. Each drop stove to spread and take up the most space, but the others, striving to do the same, pressed it, sometimes destroying, sometimes merging with it. "This is life," said the old teacher. "How simple and clear it is," thought Pierre. "How could I not have known before?" "In the center is God, and each drop strives to expand in order to reflect Him in the greatest measure. It grows, merges, and shrinks, and is obliterated on the surface, goes into the depths, and again floats up. Here he is, Karataev, see, he spread and vanished. Vous avez compris, mon enfant?" said the teacher. Tolstoy, the San Francisco Art Institute, Napoleon, too many gin and tonics, a sketch inked on a scrap of paper, Vishnu, war, Switzerland, mysticism, peace ... everything, you see, relates to everything else. Thanks to Matthew Felix Sun for his image of John Harrison's Electric Eye, photographed hanging in a gallery adjacent to where I drafted this blog post, a.k.a. La Cuisine de mon Appartement. Late last year, in a post called Changing careers, I reeled off a litany of jobs I've held since I was eight years old. Some have been fun, others a grind. Which job falls where on that spectrum isn't necessarily where you'd expect. For example, I had a great time working for McDonalds when I was in high school. The pay was laughable, even at the time, but we made a sport out of keeping up with the big lunch and dinner rushes: a kitchen-crew relay, grilling burgers, toasting and dressing buns, and assembling sandwiches to feed the hungry hoards. Every couple of months we organized a gathering of our crew's 3am bowling league at the local 24-hour alley: after the closers closed and before the openers were due to clock-in. Fun times. Wire-wrapping circuit boards in my first post-college job was tedious, but it required close-concentration and manual dexterity, so there wasn't much room to get bored. As the company grew, my responsibilities diversified. Not boring at all. The most boring job I ever had? Hands down, I'd say it was a part-time data entry gig for the Alumni Association of a certain university. A friend was managing the data entry crew, and got me hooked up as a favor during a time when I was pretty broke but interested in a flexible schedule. 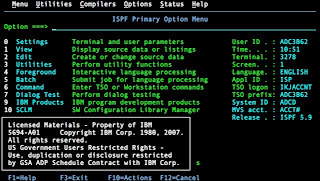 We worked in a ground floor room filled with closely packed desks and terminals that gave access to awkward mainframe computer screens. Through the computer screens we could, awkwardly, update contact information for alumni. This was serious business, of course. We're talking fundraising efforts aimed at a population of hundreds of thousands of former students. Without leads they could actually reach, the fundraisers would have no one to ask for contributions. I'd take my place behind my desk, stare at my piles of envelopes, scratch my head over the awkward mainframe computer screen and ... presto! I couldn't keep my eyes open. Literally. Twenty, thirty minutes into a shift I'd start to nod off in front of my blinking yellow cursor. I felt bad turning my back on the friend who'd gotten me hired, but after a few weeks I gave up and signed on as a Kelly Girl. What was the most boring job you ever held? How long did you last? In the course of a year -- March 2011 to March 2012 -- my reading group chose, read, and discussed two works of speculative fiction. 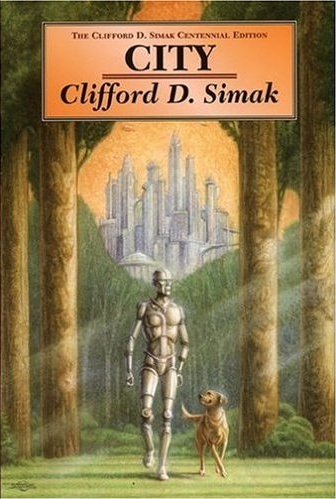 David Mitchell's Cloud Atlas was published in 2004; Clifford D. Simak's City was published a half-century earlier, in 1952. 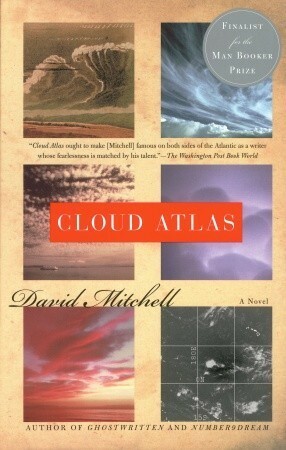 Each describes an extended period of human history: Mitchell's novel begins in 1850 and ends some thousand years later. Simak describes a period ten times as long, from the twentieth century to -- what would that be? -- the two hundred twentieth or so. Each is a series of related, and in some manner interlinked stories: Mitchell's six to Simak's eight. Mitchell's stories are nested one within another, like a matryoshka doll, ending partway through in the first half of the book, and continuing in the second. Each is linked to the next, as a story, manuscript, film, or myth discovered and/or cherished by a character living in a subsequent time. Simak's tales, originally published individually between 1948 and 1951 in science fiction magazines, are presented as fragmentary folklore of a possibly-mythical creature called "man." The stories are interleaved with scholarly commentary by dogs -- Rover, Tige, and the like, cited as reverently as human graduate students in this century might nod to Harold Bloom or Richard Ellmann or Stephen Greenblatt. Dogs are the dominant species on Earth by the end of City, who differ with one another over whether the bipedal creatures described in the tales are historical or invented. Both novels are dystopian. Not a lot of happily-ever-after in either of these works. Mitchell traces an arc from colonial inhumanity to corporate dehumanization, and ends after the fall of human civilization (the end of human civilization occurs in the middle of Cloud Atlas; having advanced a thousand years, the novel then regresses to its 19th century beginnings). For Simak, humans are doomed by their own uncontainable aggression, and decide almost unanimously to decamp from planet Earth in order to be transformed by some named but otherwise undescribed biotechnology into otherworldly and infinitely more sensitive creatures on Jupiter, leaving the planet they nearly destroyed to the more constructively-social and empathetic canines -- after enabling them to talk and read and utilize robot-companions to compensate for a lack of opposable thumbs. On Goodreads I've given a personal rating of four stars to the Mitchell novel, but recorded only two for Simak's. Why is that? What was the difference for me? I did find Mitchell's acrobatic technique impressive: six tales in six styles and six voices, and yet the stories cohere in a whole. I found his characterizations rich and credible, where Simak's struck me as wooden and allegorical (a stiffness that seemed part and parcel of the novel's overall academic conceit, but even in a sympathetic reading this struck me as too heavily applied). Mitchell's interlinking plots, and the cliffhangers at which he put five of his six tales on pause, pulled me deeper into the novel; Simak's ersatz-scholarly apparatus flattened City's drama. But it wasn't the quality of the writing that made two stars' difference for this reader. For me, there's speculative fiction and there's speculative fiction. That is to say, there's only so far I'm willing to speculate along with an author before I become ... well ... bored. Not to put too fine a point on it. Talking, reading dogs who get around their deficit in the paw department by employing robotic personal assistants? For me that's an allegory too far. Simak's fables were too far from the world I live in to induce empathy. I couldn't make myself care. I don't claim special status for my personal taste. Both these books are works of fiction, I'm as subjective as the next reader, and there are delightfully many ways to tell a tale. There were times in my own bibliophilic history when I found hobbits and elves, or Poul Anderson's exotic aliens, delicious. David Mitchell's Cloud Atlas reaches its dystopian end of human civilization without leaving an arc of human history that is reasonably, rationally traceable from the world we know today. At this novel's furthest speculative pole, the "Fabricant" Sonmi-451 is a cloned human, brainwashed by a wacky hybrid of Catholic ritual and capitalist aspiration -- not far, alas, from early 21st century reality, not nearly far enough if you ask me; though it's the reality I'd change, not the fiction. Bottom line, for me, speculation that forgoes wild improbability is speculation that satisfies. A fellow writer and thoughtful Facebook-friend posted a link the other day to an article titled People Aren't Smart Enough for Democracy to Flourish, Scientists Say. The article was published on Yahoo! News, and describes research by a pair of scientists, David Dunning and Justin Kruger, of Cornell and New York Universities respectively, who have 'discovered' that no amount of information or facts about political candidates can override the inherent inability of many voters to accurately evaluate them. The two scientists, says the article, have demonstrated again and again that people are self-delusional when it comes to their own intellectual skills. Skepticism about the competence of the masses to govern themselves is as old as mass self-government. Even so, when that competence began to be measured statistically, around the end of the Second World War, the numbers startled almost everyone. The data were interpreted most powerfully by the political scientist Philip Converse, in an article on "The Nature of Belief Systems in Mass Publics," published in 1964. Forty years later, Converse’s conclusions are still the bones at which the science of voting behavior picks. Converse claimed that only around ten per cent of the public has what can be called, even generously, a political belief system. He named these people "ideologues," by which he meant not that they are fanatics but that they have a reasonable grasp of "what goes with what" -- of how a set of opinions adds up to a coherent political philosophy. 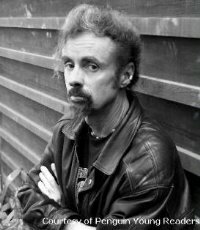 Non-ideologues may use terms like "liberal" and "conservative," but Converse thought that they basically don’t know what they’re talking about, and that their beliefs are characterized by what he termed a lack of "constraint": they can’t see how one opinion (that taxes should be lower, for example) logically ought to rule out other opinions (such as the belief that there should be more government programs). About forty-two per cent of voters, according to Converse’s interpretation of surveys of the 1956 electorate, vote on the basis not of ideology but of perceived self-interest. The rest form political preferences either from their sense of whether times are good or bad (about twenty-five per cent) or from factors that have no discernible "issue content" whatever. Converse put twenty-two per cent of the electorate in this last category. In other words, about twice as many people have no political views as have a coherent political belief system. Nobody can straighten American politics out because the people won't stand for it -- how can the internal economics be put in order when everybody wants everything? Any sane monetary policy or farm policy doomed to ruin. Ditto by logical extension foreign policy. Bread and Circuses. Are we seeing a trending assessment here? I asked it last month, but in the wake of Super-indecisive Tuesday's indecision I'll ask again: have you been watching the G.O.P. race to the bottom? ... I mean, contest for the party's presidential nomination? At dinner the other night the topic of politics in China came up, as it often does (as half of our household was born and raised there). My partner had just read a story about Li Xiaolin, daughter of the fourth Premier of the PRC, Li Peng, a.k.a. the "Butcher of Beijing" for his role in advocating force in response to the 1989 protests on Tiananmen Square. Well, I suppose that's just the sort of thing one can look forward to should one act on a scientific determination that democracy is a bust because people are too dumb to know what's good for them. I'm not saying Philip Converse or David Dunning are wrong. And in my humble opinion, Gary Snyder is just about always right. I'm only pointing out that maybe, just maybe, the alternative to democracy's failings is ... worse. Happy International Women's Day to all and sundry! 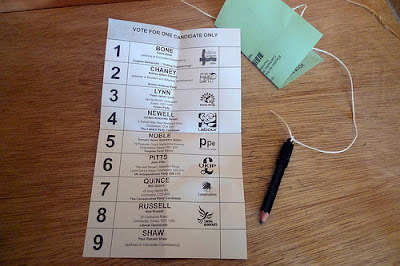 Thanks to lynnepet (Lynne Pettinger) for her image of a ballot paper from the May 2010 general election in the U.K.
Small-Space Container Gardens, by Fern Richardson, arrived in bookstores last month. I found it at Mrs. Dalloway's Literary and Garden Arts, the nearest independent bookstore to where I live. Mrs. Dalloway's serves the many, many gardeners in Berkeley -- the folks who make walks around town so easy on the eyes. But it also caters to the literati. While I was there this weekend I picked up The Selected Letters of Allen Ginsberg and Gary Snyder to complement what may be the first gardening book I've ever bought in my entire black-thumbed life. Why a gardening book? Why now? Why a focus on gardens composed of plants in pots? In reverse order: because I live in an apartment; because the book was just published; and because Fern Richardson is my cousin and I'm delighted that Timber Press has brought her expertise and sensibility to gardeners everywhere. Fern blogs at Life on the Balcony. Those who want to verify that this author knows her container gardens thus have ample opportunity to try before they buy ... Fern's blog is a hyperlinked cornucopia for gardeners of modest estate. Genetics suggest that I should be a terrific gardener. My mother and grandmother grew bountiful plots of vegetables and herbs from the time our family moved to California. My sister has a green thumb, and her partner has a greener thumb still. And then there's Fern, on my father's side of our family, who's talented enough to publish on the topic ... she credits my father's sister, her grandma, for helping her to get started. So much for genetics. I can barely keep a cactus alive. So the other night I carried my newly-purchased copy of Small-Space Container Gardens to the café down the street, ordered dinner, and turned first to Chapter 8: Green Thumb Crash Course - Learning the Essentials for Success. By the time salad arrived I'd learned that I pot plants incorrectly (though now I know better! ), and that I'd be well-advised to buy a better grade of potting soil than the cheap stuff on sale at the hardware store down the street. At least I've been watering at the right time of day: "in the morning [to give] the sun a chance to dry up any water droplets that landed on leaves, reducing the likelihood of a moisture-loving disease afflicting your plant." As I paged through her book I was particularly amused by Fern's reference to a Supreme Court case: "Also, ignore what the Supreme Court wrote in Nix v. Hedden: tomatoes are not a vegetable, they are a fruit." Though you wouldn't necessarily think it of a master gardener, Fern has a law degree ... giving her citation of 19th jurists particular zing. Small-Space Container Gardens has something for everyone. Interested in attracting birds and bees to your balcony? Chapter 3. Is your goal to plant a garden that will transform your balcony into a private oasis? Chapter 6. Concerned about weather's effect on your budding plants? Chapter 2. Are you interested in dining on your container garden's bounty? Chapter 4. Apologies for the blurriness of my iPod's photo of Small-Space Container Gardens on the display table at Mrs. Dalloway's bookstore. The book itself is crystal clear and beautifully illustrated. I was delighted to discover that this image was the author's first sighting of her book "in the wild." I ride my bicycle to work most days (other days I walk or take a bus). I also use my bike to get around on my days off, if I'm not walking or taking a bus or riding our regional transit system, BART. Occasionally, when going someplace far or late at night, I drive. Sometimes when I ride my bike I use streets in Berkeley that are designated as "bicycle boulevards" by the city. These are streets that are peppered with signs and painted/striped to notify automobile drivers that the streets are specially designated to be shared with bike riders. This is not going to be one of those cyclists are perfect posts. I'm among the first to admit that in Berkeley (and Oakland, and San Francisco) some bike riders behave arrogantly and foolishly, recklessly ignoring basic rules of the road, and leaving common sense to wither in the gutters. I see cyclists run stop signs and red lights, even in the face of oncoming traffic, pretty much every day. It's an ongoing marvel to me that bike riders seem to believe that some imagined moral superiority -- 'my mode of transport has a lower carbon footprint than your mode of transport' -- will keep them from getting creamed by a ton of gasoline-powered metal. Or that their recklessness won't seriously harm a pedestrian or another bike rider. 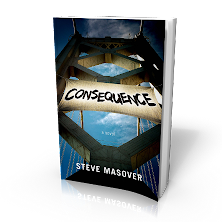 Those are misfortunes that have really happened in the Bay Area, and recently. Just this past summer, A woman who was badly injured when she was struck by a bicyclist in a crosswalk at Mission Street and the Embarcadero died (Pedestrian Hit by Bicyclist in San Francisco Dies, KCBS, 11 Aug 2011). Double-plus-bad news, for all involved and for bicyclists everywhere whose 'relationship' with car drivers is made more antagonistic and distrustful by reckless bikers. It would be nice to fix this sort of misbehavior with the wave of a magic wand. Alas. Instead, I'm disappointed to find myself wishing a cop would ticket a reckless bicyclist almost (but not quite) as often as I wish the same for an idiot driver talking on a cell phone or texting while hurtling along a street shared with attentive but vulnerable drivers, bicyclists, and pedestrians. On the whole, though, as a means of transportation bicycles are a significant social good compared to cars. Now don't get wound up about over-the-top bicycle enthusiasts and their hideously neon cycling gear. I'm focusing here on pedestrian cyclists, as it were. Bikes can get most people where they want to go, within reasonable distances and over terrain that isn't too hilly. They're faster than walking; they're easier to park; they don't require fossil fuels to operate; they take fewer resources to produce; and biking is far more beneficial to a user's health than driving. For those able to use them, and for trips that can reasonably be traversed on a bicycle, what's not to like? I'm going to go further. I think that government -- city government, mostly, sometimes encouraged by state and federal subsidies -- is an excellent instrument by which to encourage this social good. Because enormously powerful market forces, including massive lobbying of government at all levels, already encourage and facilitate automobile use, often to the disadvantage and disincentive of bicyclists (cf. Larry Cohen's post on this topic, Creeps and Weirdos: The Auto Industry Agenda for Keeping You on Four Wheels, in the Huffington Post, 2 Feb 2012; and his link to dollar figures on automotive industry lobbying on OpenSecrets.org). Because bicycles travel over the same urban corridors (a.k.a. streets) that cars do. Because absent accommodation and encouragement for bicyclists, sharing the streets with cars is dangerous and frustrating, and sometimes lethal. Most of what we see on policy questions in national news reports and widely-broadcast political debate has to do with policy that costs a lot and has enormous consequences. Things like health care, fossil fuel extraction, military spending, and public education. I think it's worth a peek into the work of effecting 'small-scale' policy: how it's done, how it evolves, and what effects it has. That's why I liked an article I chanced upon over the weekend. Titled A Banner Year for Bikes, in the weekly East Bay Express of Feb 22-28, this article by Nate Seltenrich was an unexpectedly engrossing read. It's not a long article (heck, at the rate I bloviate, this post is just about as long as its 1200 words!). The Express article neatly packages insight into how cities encourage behavior that results in social benefit. Benefits like making it safer for bikes to travel city streets, and therefore more common for people who can do so to rely on bikes instead of cars. The idea is to combine traditional sharrows [signs painted on the pavement near the middle of the lane that encourage bicyclists and motorists to share the road, and direct cyclists where to ride] with a solid strip of green paint five feet wide, like taking a giant highlighter down the middle of the lane. This design will provide a strong visual reminder for cars to share the road with bicyclists, even if there is no extra room allotted for bikes. [...] Such a bold approach suits 40th Street because of its relatively high traffic speed, [the city's Bicycle and Pedestrian program manager, Jason] Patton said. Without a clear signal that bicycles are welcome, they're liable to get run off the road by impatient or intolerant motorists — despite their legal right to be there. "There's a lot of pressure on bicyclists to get out of the way," Patton said. "We're trying to find a way to make that legal message strong enough in how the street looks." "I think it's gonna be a pretty dramatic message that we think will change behavior," he said. And the upside is huge: With 96,000 people living within two miles of MacArthur BART -- and with 40th Street in Emeryville poised to serve as bicyclists' on-ramp to the eastern span of the Bay Bridge starting in late 2013 -- the new $300,000 connection could become one of Oakland's most valuable bikeways. Plus, if the super sharrows work, the city may look to apply them to similarly troublesome stretches throughout the city. Such progress is the stuff of silver, gold, and platinum-rated bicycling communities. This kind of community-based policy development is, for my money, an example of government investment that affects how we live in positive ways. It's investment of common resources for a common good -- good that wouldn't be realizable if left purely to profit-driven actors and drivers concerned with getting where they're going in a hurry. I'm happy to pay taxes for sharrows and stripes that encourage people in my community to choose bikes over cars when they reasonably can. Thanks to the Humanity Ashore - On Wheels blog for the image of a sea of bikes outside St. Sebastian's Cathedral in Mannar, Sri Lanka.